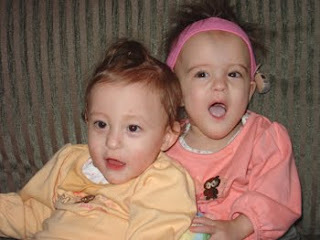 This is Holland (right) and Eden (left) on the day that they came home from the NICU, also their due date, November 17th, 2004. Today's photo session... It's getting harder and harder to get good pics of the girls together. They won't hold still for a minute! Today was a day for a little reflection. 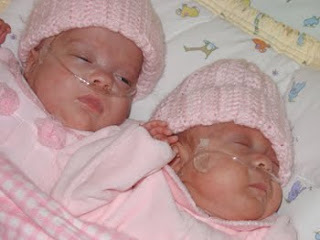 It was Holland and Eden's 1-year age adjusted birthday, and the first anniversary of their NICU graduation. 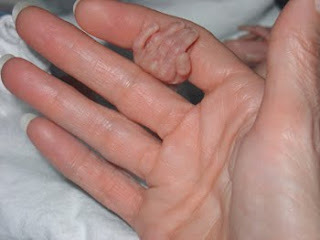 My mom and I took the girls to the NICU for a little visit. We got to see two of the neonatologists, and a bunch of our favorite nurses and staff. It was fun to show off the girls and have everyone comment on how big (and CUTE!) they are. I'm sure that St. Joe's has the best NICU staff around. I can't imagine anywhere better that we could have been under the circumstances and I am forever grateful to them for all that they have done for my family. I know some of you are reading, and I just have to say...you guys rock! Oh, and did I mention that my kids are DAMN CUTE??? The girls have come so far. Its so hard looking back ,seeing what our babies have gone through in their short lives. My twins are 10 months old today,and I am posting their new born pics , as well. That top picture of yours is so awesome, it really shows their size. I pray that your girls will continue to get strong and grow everyday! Good Luck with the cold season..
Great post and happy 1 year due date birthday! The girls are damn cute and look at that tiny hand! So sweet! Wow, Billie. Its so amazing how far you all have come. I am constantly in awe of what God has done and when I look at the smiles on Holland and Eden's faces, I am reminded once again that LOVE conquers all! They were beautiful then and are beautiful now. I love reading about your girls and am in awe of you and your husband. Thanks Billie, and they are damn cute. yes, thanks billie. pics of the girls always make my day better. i mean that. i love how you can almost tell what they are thinking. 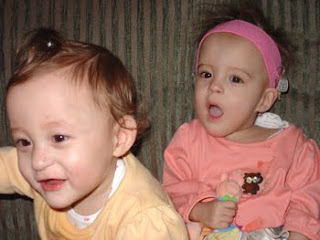 happy due-date b-day little girlies. love you both so much! happy due date b/day little girls!! I can't believe how big they are now. It's amazing to have seen their personalities develop through the pictures you've taken. They are definitely gorgeous! Thank you so much for posting your website of your beautifule girls. I saw you at the NICU on the girls' due date birthday and wanted to let you know how much encouragement you and your daughters provide us. We have girl/boy 23 week twins at the NICU now, who are 31 weeks today and going strong. It's quite a journey, but every little cuddle makes it all worthwhile. Congratulations, Holland and Eden! What a huge milestone! And more congratulations, Billie and John! What an amazing journey you have come through, and what precious girls you have to show for it. They are so big, healthy and so sweet and cute! Isn't it terrific to look back to those early days, knowing now that your story has such a "happy ending"? Though of course this is not the end - your family journey continues on with new accomplishments and new joys every day. I'm so glad for you! 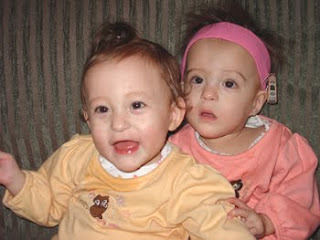 Happy due-date birthday, Hollie and Edie!